The telecast of Prince William and Kate Middleton’s wedding ceremonies drew in more than 26 million viewers—that’s one of the largest audiences in the history of UK television. The total number of viewers across BBC One, BBC News, Sky News and Sky Living, and ITV1 were combined peaking at the 26 million mark on Friday morning. This number includes the hundreds of viewers crowding to watch public screens across the UK, and those gathering at Hyde Park to watch the spectacle live. 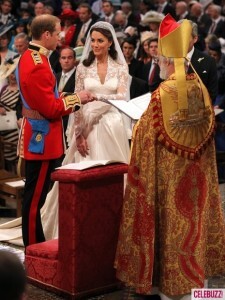 According to survey reports, more than 90% of Britons and those living across the United Kingdom with an available television witnessed the ceremony. Though very impressive, the royal wedding failed to match the audience draws of some of the most historic moments of television. The most viewed television event is still England’s 1966 win in the Wold Cup, which drew more than 32.3 million viewers; Princess Diana’s funeral, which drew in 32.1 million; the divorce episode of Den and Angine on Eastenders, with 30.1 million; and finally, the most viewed royal wedding of all time, Charles and Diana’s Wedding, with 28.4 million. Its worth pointing out however, that television viewership in general has been on a slow but steady decline, largely due to the advent of the Internet. Statistics have yet to be released on the number of Internet users who saw live streams of the ceremony online. Analysts predict that the number will also be record-breaking.